Living in a a small apartment building has it’s benefits especially when the neighbors share common interests such as cycling. One such benefit is a common access area where the bikes are stored or shall I say where the tire pump was stored. Unfortunately though one of my closest friends and neighbors decided to take advantage of low home prices and interest rates and moved out mostly. I say mostly because she still has keys to the place and her bike is still here. She also drops her cat off daily to hang out with her buds, but that’s another story. Anyhow here moving out means she also took her tire pump with her which leaves me somewhat pump-less. This isn’t to say I cant fill tires at all. I have a frame mounted pump on my GARY FISHER SUGAR mountain bike as well as the GENUINE INNOVATIONS PROFLATE ELITE INFLATOR stowed in my CANNONDALE CARBON 5 SYNAPSE. However the frame pump cant reach the psi required for road bike tires and to use the PROFLATE for maintenance filling seems like a waste of money. So I set out to buy a FLOOR PUMP to call my own. This quest turned out to be a little more challenging than I thought it would be. While there are many pumps to choose from many only receive moderately good reviews for pump life and accuracy. However one pump brand seemed to receive pretty consistent positive reviews on the things that matter. That brand is LEZYNE. The LEZYNE series of floor pumps appear to be precision tools from the ground up. The pumps are also very retro looking when equipped with wood handles. Settling on the LEZYNE brand was only half the issue. I still needed to decide which model pump to purchase. LEZYNE has no less than 8 tire pumps in their HIGH PRESSURE or HP series of tire pumps. In the end I selected the Lezyne CNC Travel Drive Floor Pump because according to the design specifications it was one of the two best LEZYNE pumps. The CNC Floor Drive was the other. The Lezyne CNC Travel Drive Floor Pump is a more compact and lighter version of the CNC Floor Drive. On sale the Lezyne CNC Travel Drive Floor Pump was not much more than the other LEZYNE offerings. For the record they all feature the same maximum pressure readings. The differences are materials, colors, weights and handles. Truth be told I wish the Lezyne CNC Travel Drive Floor Pump had a wood handle. Wood is better in cold climates for the un-gloved hand. The Lezyne CNC Travel Drive Floor Pump is a “Lay Flat Design” which is nice. Some pump bases take up un-needed storage space when packed for travel. The Lezyne CNC Travel Drive Floor Pump is very light despite appearances. Manufacturing quality is first rate by all external appearances and the ABS FLIP THREAD CHUCK is brilliant. In use the LEZYNE ABS FLIP THREAD CHUCK works fantastic. You select the end that matches your valve stem. Most visitors here will select the “Presta” end of the LEZYNE ABS FLIP THREAD CHUCK. If your not sure which end to use it’s simple to figure out. If your valve stem is fat like your car tire it’s a “SCHRADER VALVE“. If the valve is skinny, delicate looking with a lock nut on the end you have a “PRESTA VALVE” which is standard on most good bikes. Anyhow you simply thread the LEZYNE ABS FLIP THREAD CHUCK on to your valve stem and pump until you reach your desired pressure. If you need to relieve pressure depress the little black extended button on the LEZYNE ABS FLIP THREAD CHUCK and you can relieve air as needed. Note: There are what appears to be two buttons on the LEZYNE ABS FLIP THREAD CHUCK, a large and small. The large one is in fact a screw and does not move. You want the little one that is sticking out. What more can I say. The pump works and works well. There is no wrestling match with the valve stem. The pump fills tires quickly, maintains pressure with a few pumps. The gauge is more accurate than most bike pumps. About the only thing I can fault with the pump isn’t a fault as much as something to be careful of. During storage the LEZYNE ABS FLIP THREAD CHUCK screws into the handle. This keeps the handle closed and protects the threads of the LEZYNE ABS FLIP THREAD CHUCK from damage. My concern is the less than mechanically inclined can possibly cross thread the LEZYNE ABS FLIP THREAD CHUCK while storing it. I suggest a drop of oil or grease in the threaded hole of the handle. The threads should and do start easily. If they do not you are cross threading them. Remember “Righty Tighty” and “Lefty Loosie” or Clockwise Tighten for storage, Counter Clockwise loosen for use. 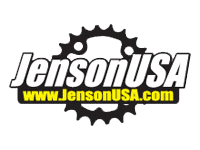 I bought Lezyne Floor Pump on sale at Jenson USA. The Lezyne CNC Travel Drive is the ultimate travel floor pump with all the capabilities of a full-size floor pump in a compact size. All components are custom CNC machined aluminum, resulting in a durable and lightweight design. 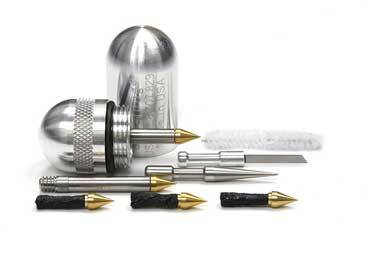 The ABS Flip-Thread Chuck works on both Presta and Schrader valves. The included Speed Chuck makes this pump compatible with disc wheels. The 1.5” gauge is compact and precise. The Lay-Flat design and included felt lined canvas bag protect the pump during transport and storage. An anodized high polish finish make this pump stylish and durable. The Speed Chuck is a great add-on to Lezyne floor pumps. It screws onto the Flip-Chuck head at a right angle to make it easy to fit in a disc wheel’s valve cavity. It uses washers so you can just press on the chuck without fiddling with screwing on threads. And because it’s added beyond the Flip-Chuck, you still have use of the bleeder valve. While the Speed Chuck comes standard with all current Lezyne floor pumps, it can be lost. And older pumps didn’t come with it, so it’s a nice upgrade if you’ve had your Lezyne for a while. The Lezyne speed chuck is made of composite matrix. In the package are six seals (aka washers) so if you wear out the seal keeping the chuck on the valve, you can just open up the chuck and replace it. 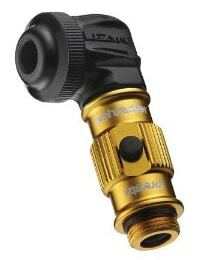 The Lezyne Speed Chuck is a Presta-only Slip-Fit System adapter designed for fast valve engagement. The 90-degree bend is compatible with disc wheels. The 2-piece Composite Matrix design makes replacing O-ring seals quick and easy. Six seals are included. It is compatible with all ABS Flip-Thread Chucks and available on all Flip-Thread Chuck equipped pumps, and the color is Black.